During the summer it seems as though vegetables may take a back seat to fruit. But I am here to tell you vegetables are back in all their glory. This grilled cauliflower is so delicious. You won’t even know your eating a vegetable. Grilling the cauliflower brings out a whole new flavor to this sometimes overlooked vegetable. And topped with the vinaigrette its a delicious starter or side dish. Mince and mash garlic to a paste with a pinch of salt, then whisk together with lemon juice, 2 tablespoons oil, olives, and 1/2 teaspoon pepper. Heat grill to medium. Using a small paring knife trim away any stem at the base of the cauliflower. Do NOT cut the core. Stand the cauliflower upright. Using a large serrated knife start at the top center of cauliflower head, cut two 1-inch-thick slices of cauliflower, cutting through stem end. Reserve excess cauliflower for another use. 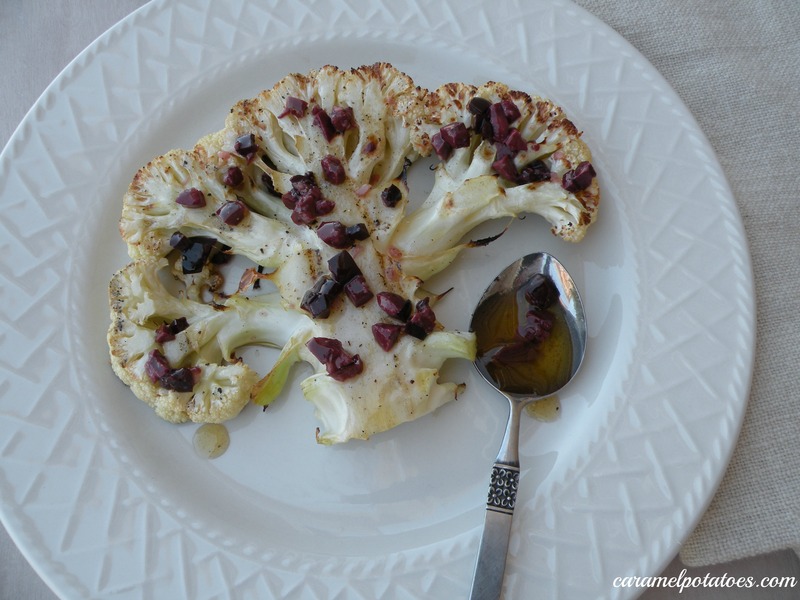 Lightly brush both sides of the cauliflower steaks with olive oil. Salt and pepper both sides before placing on the grill. Carefully set the “steaks” on the grill, and cook for 8 minutes. Use a spatula to carefully flip the cauliflower and grill for another 8 minutes, or until both sides are lightly browned and tender. Transfer to serving plates and top with Kalamata Vinaigrette. Serve immediately. Ohh I’ve been wanting to make some grilled cauliflower, this looks delicious!! !